I finally got my hands on this baby! I ordered it with Zoya's 3 free nail polishes promotion back in early January. Unfortunately Kelly was on backorder this whole time. It finally arrived Friday after waiting for almost two months. 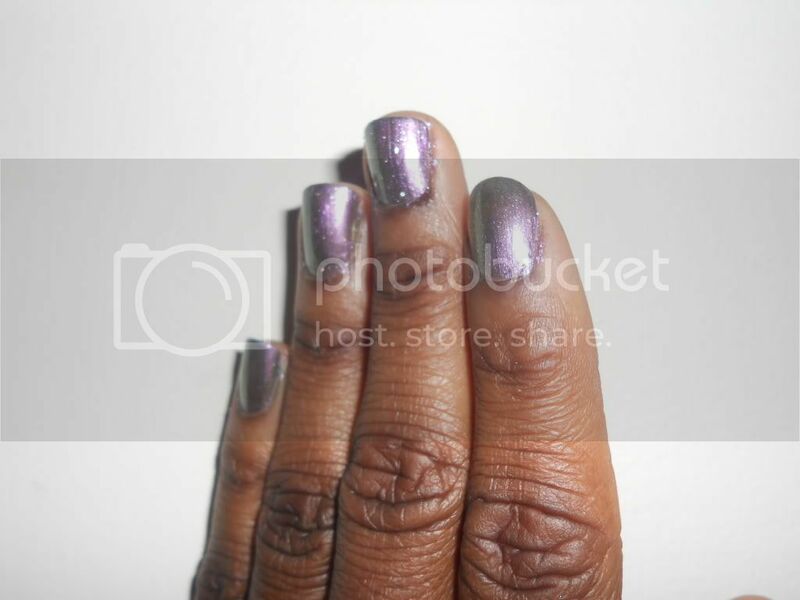 Zoya Kelly is a beautiful dusty gray cream with blue and purple undertones. Application was flawless. With just one coat, it was already opaque. But I did two to get the most vibrant color. Every ten minutes you'll catch me staring at my nails, that's how pretty this color is. As much as I love creams, they do not love me. For some reason, creams always crack on me. I'll make sure to make another post if this one does the same. UPDATE: Some miracle came through and this cream did not crack on me! OPI's Not Like the Movies is from the new Katy Perry Collection. It's a very pretty gray with green and purple duo-chrome. I saw the entire collection when I went to buy this but I really didn't care for the rest. I love that it changes color in every lighting. But if you are under bad lighting, you can see the gray come out. I was feeling something fun and summer-y. I'm so tired of dark winter colors! I was in a rush, so excuse my cuticles please. 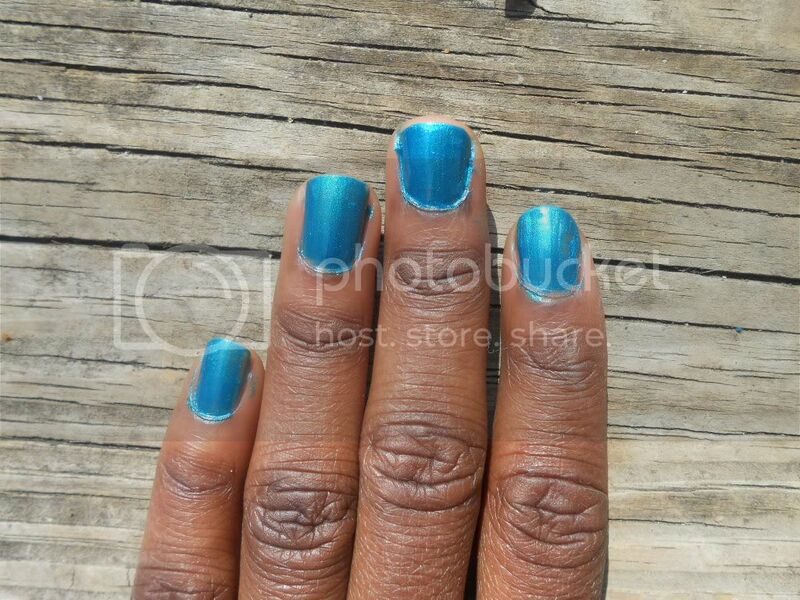 For this manicure I applied three coats of Orly It's Up to Blue. Then I applied one thick coat of Nicole by OPI Nicole...Spotted (from their Gossip Girl Collection). 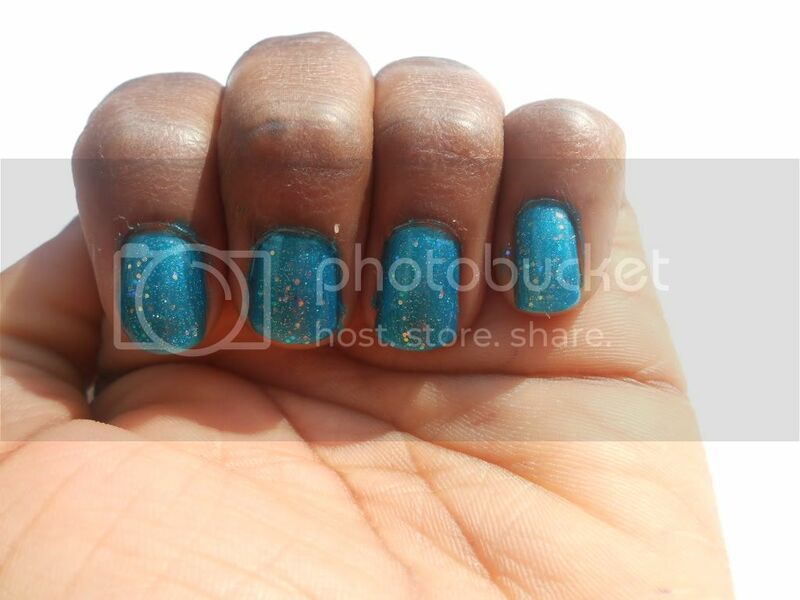 I really like the look of this manicure. Nicole...Spotted has these pretty green shimmers but still has those big blue glitters. And It's Up To Blue is so bright and pretty I can hardly stand it! They were both easy to apply and were practically made for layering. Not too long ago I purchased L.A. Colors Bronze Bombshell. 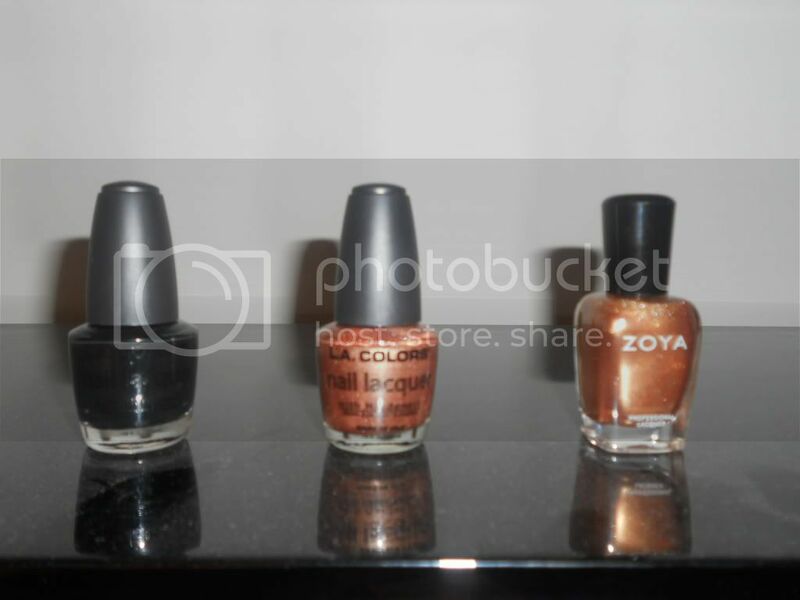 But long before that I ordered from Zoya's 20,000 Facebook fans promotion where I got three free nail polishes. One of the three that I ordered was Zoya Richelle. 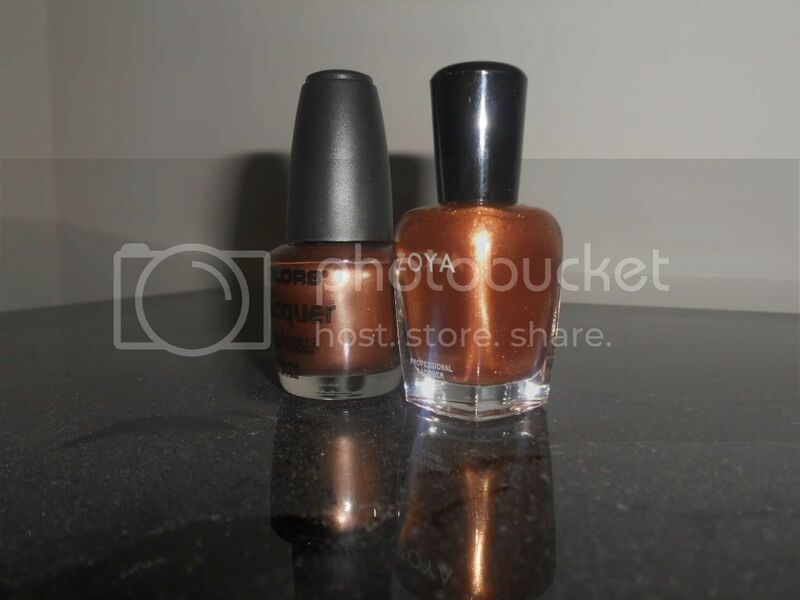 I received my order about a week after purchasing Bronze Bombshell and was disappointed to see that the two colors were almost identical. In my small collection, this was not okay with me so I thought I'd darken it into a nice brown-ish color. Since that didn't work--at all--I decided to pick up the bottle and pour in a generous amount of black. But I made sure not to add too much because black can be very overpowering. As you can see, it is visibly darker and much more brown tone. It's still got a bit of a bronze shimmer to it, but I'm alright with it because it's not very noticeable in person. For my first franken, I'm pretty pleased. Today I have a very small haul for you all. JCPenney recently sent me a $10 coupon in the mail. I thought "It's basically free money, so why not use it?" To be honest, I had no idea what I'd buy there, since I don't particularly like the style of clothing they sell there. But I asked if they sold nail polish and they did; OPI! They had a small display in their salon but I decided on Not Like The Movies from the Katy Perry Collection and It's Totally Fort Worth It from the Texas Collection. Not Like The Movies is a gray with green and purple duo-chrome. 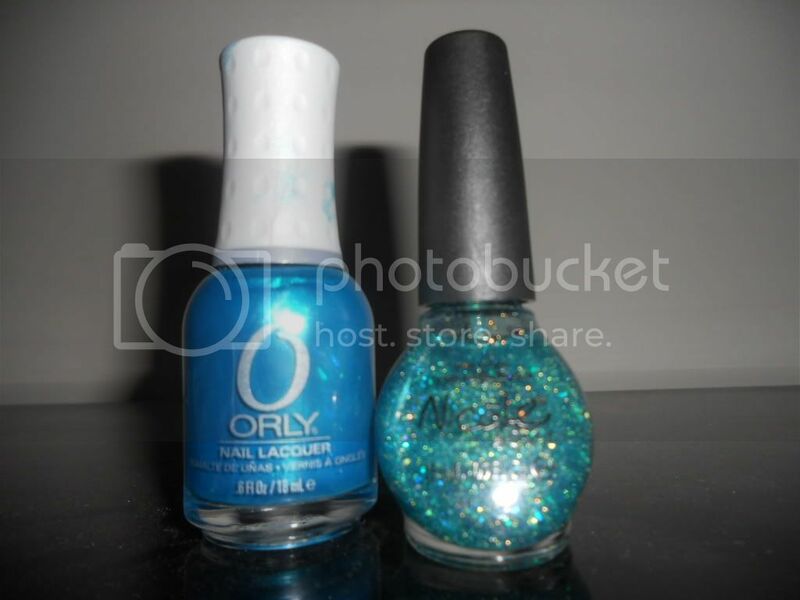 This color reminds me of Orly Space Cadet (which is number one on my wishlist). I think I'll be wearing this as my next manicure. It's Totally Fort Worth It is a shimmery gray lavender that is so incredibly pretty. I really love the pink shimmers. It really adds something else to the color. To be honest with you, this is the only color I liked from the whole collection. On my way home I stopped at Dollar Tree and picked up Art Deco in Black Sparkles and at Michaels to pick up two paint brushes from the brand Simply Simmons. I have been needing paint brushes for nail art, and now I have two great brushes for that. Expect some more freehand soon, but for now, see you in my next post! I'm one of those people who like to get the longest wear out of their manicure. I normally go for at least five or six days with no chips before I change out my manicure. I guess you could say I like a different mani every week. 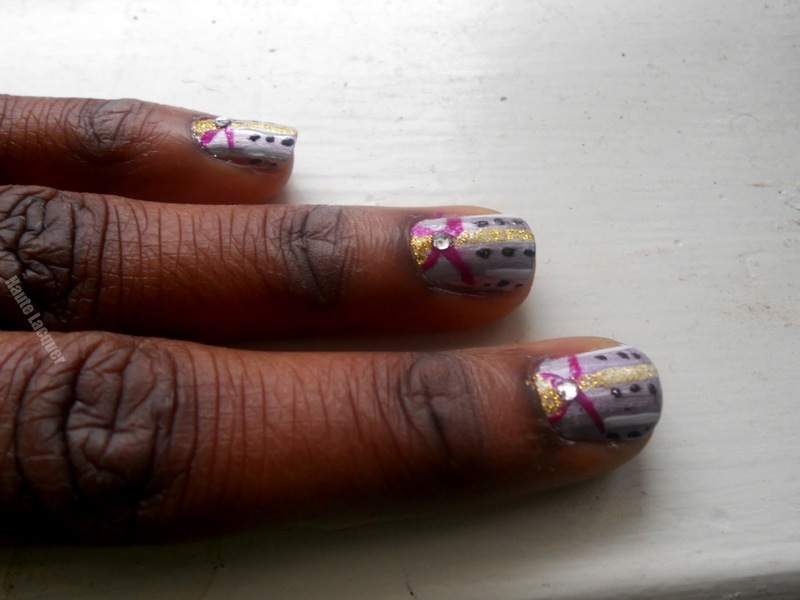 Well I was getting bored of my last manicure, so I gave my nails a fresh new polish and some simple nail art. 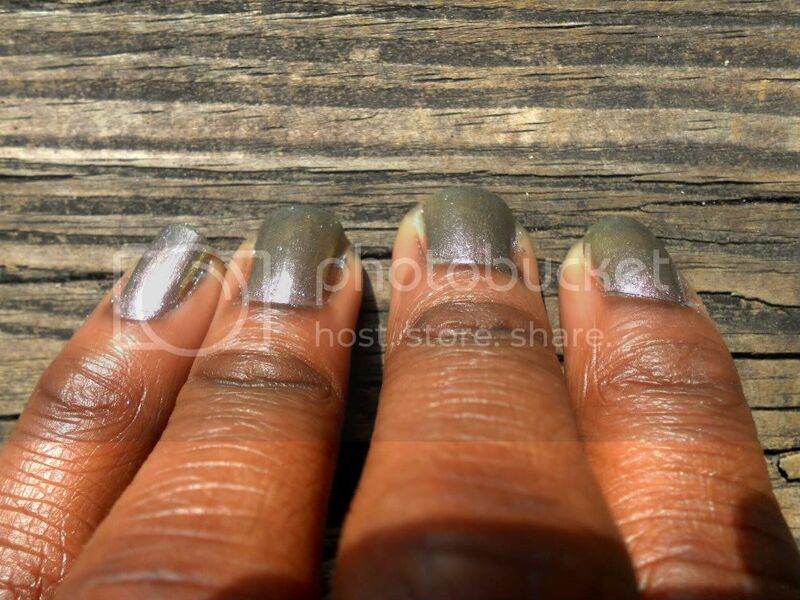 Zoya Richelle is a gorgeous, bronze, antique gold. It has a nice metallic finish and a little bit of that "metal" look. This polish applied so smooth, almost like butter. It's true to color, the color you see in the bottle is what you see on your nails. 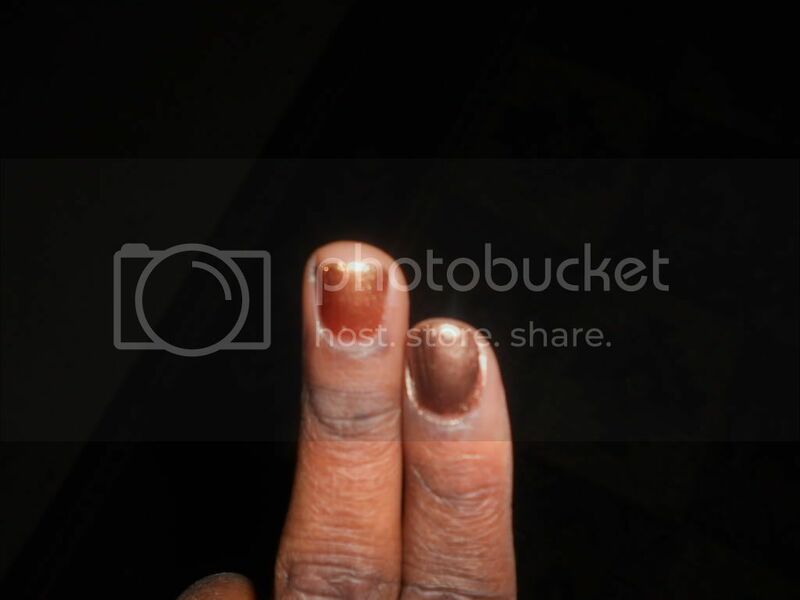 It dried in about 10 minutes and the "nail polish" smell was barely there. 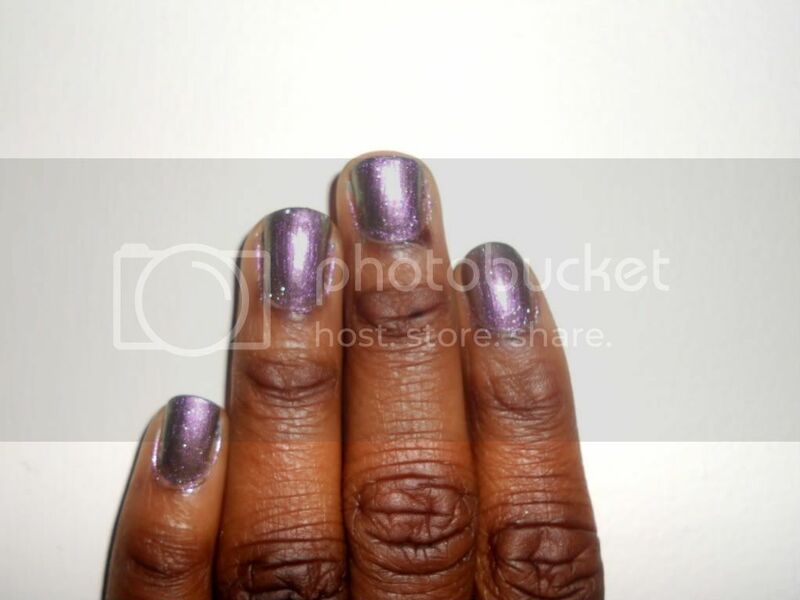 Richelle is so opaque, in this picture below, I only applied one coat. 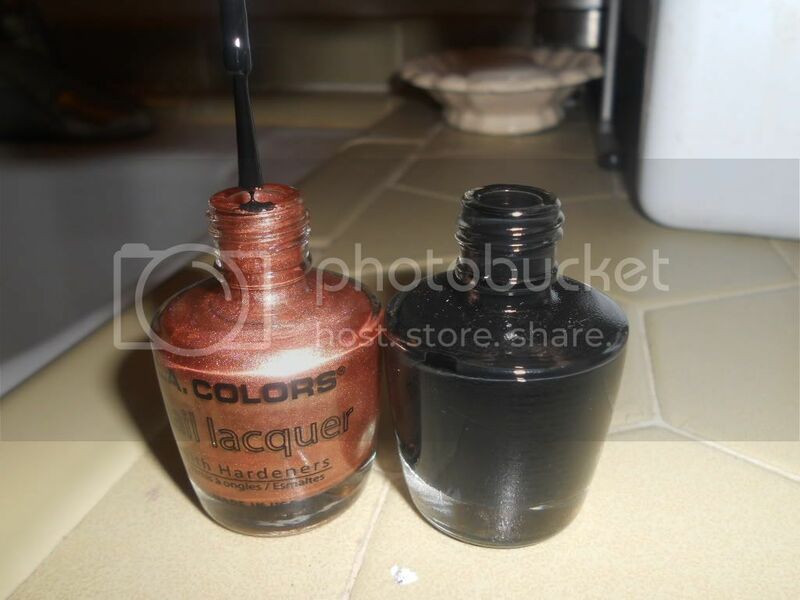 But to get the strongest color, two coats was plenty. I thought I'd spice it up a little bit so I added stripes and dots. Unfortunately, I'm not that creative. 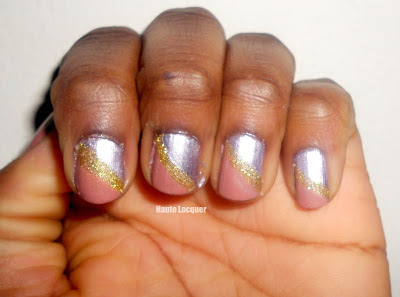 I copied this nail art idea from Deez Nails who copied it from Dees Polish who copied it from a gorgeous manicure. 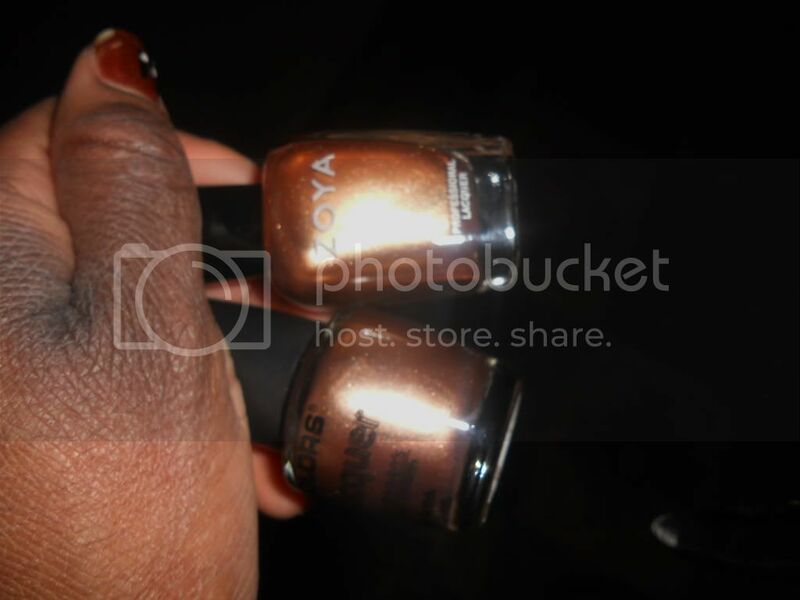 Zoya Richelle- bronze antique gold with a metallic metal finish. As much as I am loving this manicure. I'm taking a break from Art Deco. I feel like I use them for every manicure I do. It's coming along slowly, but I thought I would start off this blog by showing you how big it is now and as it grows I'll post more and more pictures. So far I only have 65 nail polishes. I have the most Revlon, then Nicole by OPI. My goal is to have 100 by June or July of this year. I don't even know what I was going for with this look. I guess I wanted something interesting, pretty, but still simple. Instead I got messy and ugly. I tried to clean it up after these pictures but I still didn't like it. Pure Ice Jamaica Me Crazy- I used this bright pink for the stripes on the base of my nails. That was the messiest part of this look. Nicole by OPI Light A Candle- Gorgeous color! I applied this metallic lavender color as the base color. I used this for another manicure recently, but I used it again since it's gorgeous with just one coat. 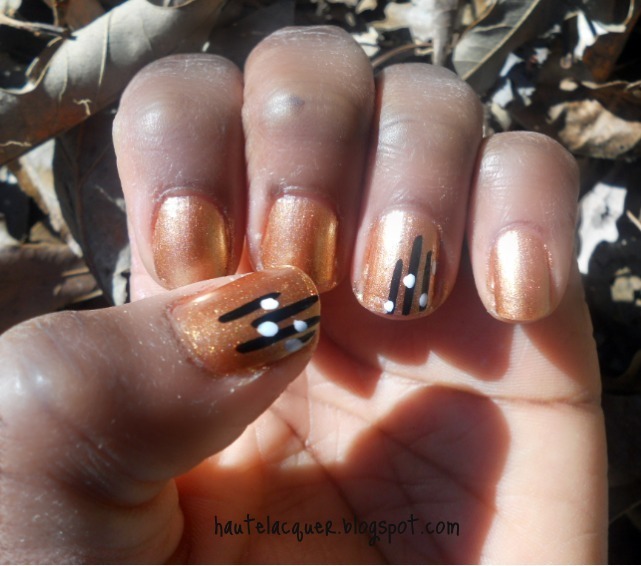 Art Deco in White, Black, Gold Glitter- I used the white for the stripes at the tips of my nails (see second picture). Then I took the black nail art pen and dotted three dots next to the white. 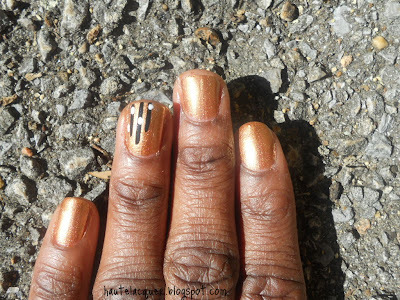 The gold glitter nail art was striped down the center of all my nails. 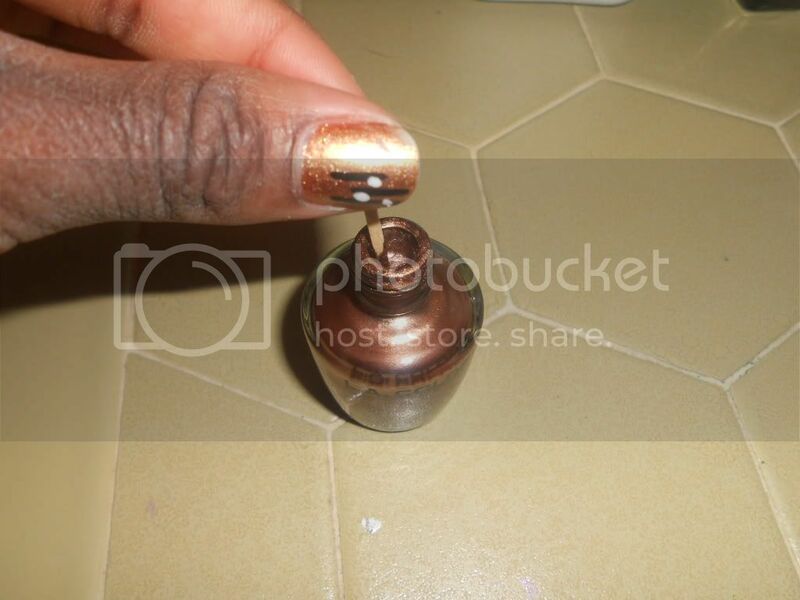 Professional Nail Care Top Coat- I made sure all of the polish was completely dry before I added this top coat. 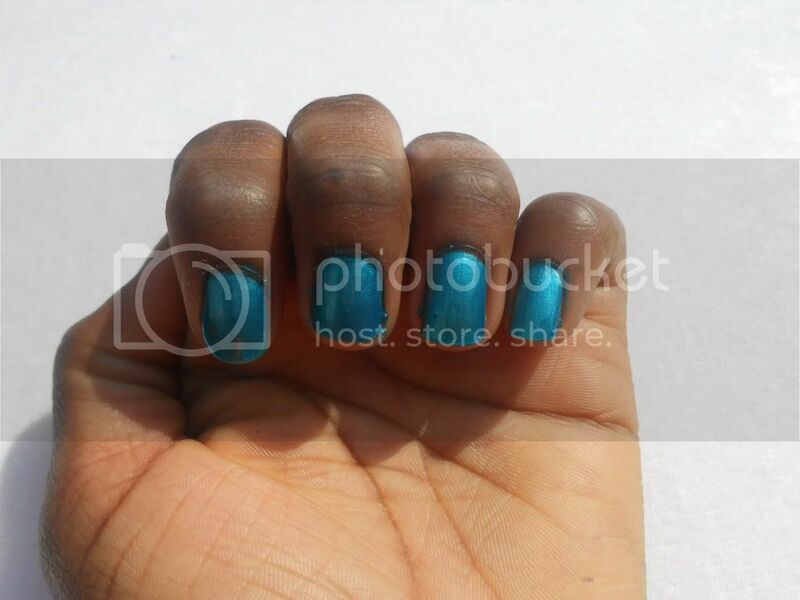 The idea for this manicure was nice, but it did not translate well. At least I can now learn from this mistake. I thought I'd do a quick post about the nail polish I'm wearing today. I quickly did this last night so I didn't really have time to worry about my cuticles or clean up. Please ignore those two issues. First, I used Nicole by OPI in Light a Candle as a base, then I added L.A. Colors Serenity to the top half of the nail. To conceal the line where the two meet I used L.A. Color's Art Deco in Gold Glitter for the horizontal stripe. See the bottom of this post for a small review of each polish. L.A. Colors Serenity- This is a nice taupe color with a hint of pink. It has tiny gold shimmers in it, but I failed to capture it in my pictures. This color is opaque with just one coat. 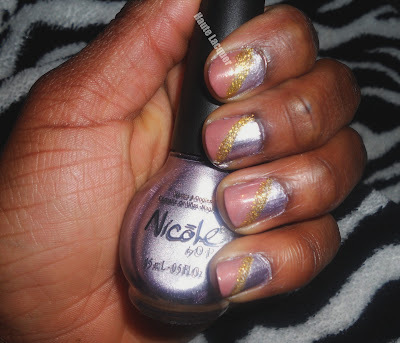 Nicole by OPI Light a Candle- A metallic lavender purple. 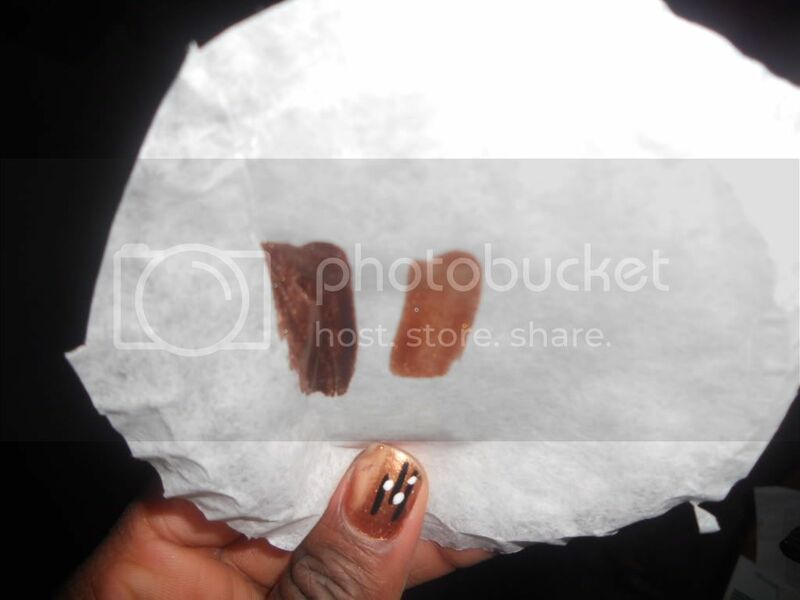 It is incredibly opaque with just one coat and it dries super fast. It does leave a little bit of a streaky finish, but it's too pretty to pass up, so I don't mind. Art Deco Gold Glitter- A glittery gold nail art polish that is a bit closer to yellow than a true gold. I went over the stripe twice to get it opaque. I'm very happy with this manicure, and can I say that it looks much better in person? The pictures do not do it any justice. In person, the minor mistakes are not nearly as obvious. Maybe I'll take my pictures in the daytime from now on. I'll probably end up re-taking these pictures in the morning. 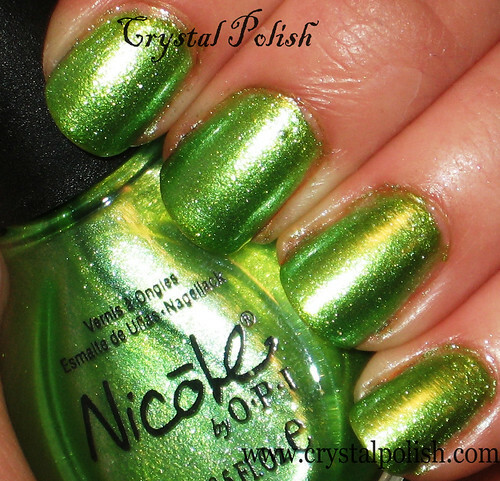 Nicole by OPI's Make Mine Lime is a gorgeous lime green nail polish with a foil-y, sparkle finish. This polish was extremely sheer. I had to apply five coats to get it opaque. Four coats would have been fine but there were a few bald spots. The best thing about Make Mine Lime is the amazing wear that I had with it. With a top and base coat, this lasted me a good 7 days. I have school and sports so a small amount of chipping (hardly noticeable) is great. 4.5 out of 5. If it weren't for the sheerness, it'd be a full five out of five. I purchased my bottle from Ulta, you can also purchase this at Walmart and Sally Beauty Supply stores or website. I didn't have a swatch for you guys so thank you crystalpolish.com for this accurate picture. I came across this tag on one of my favorite blogs and I had no choice but to do it. I changed it up a bit, just...'cause. 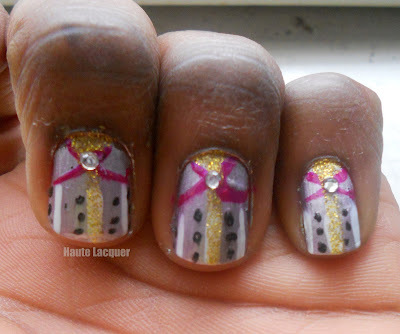 If you are a nail polish fanatic, you'll understand why these tags are so hard to pass up. Let's get into it, shall we...? As of right now, I have 65. I'll be adding to that soon though. I just can't control myself. My goal is to have at least 100 by June or July of this year. 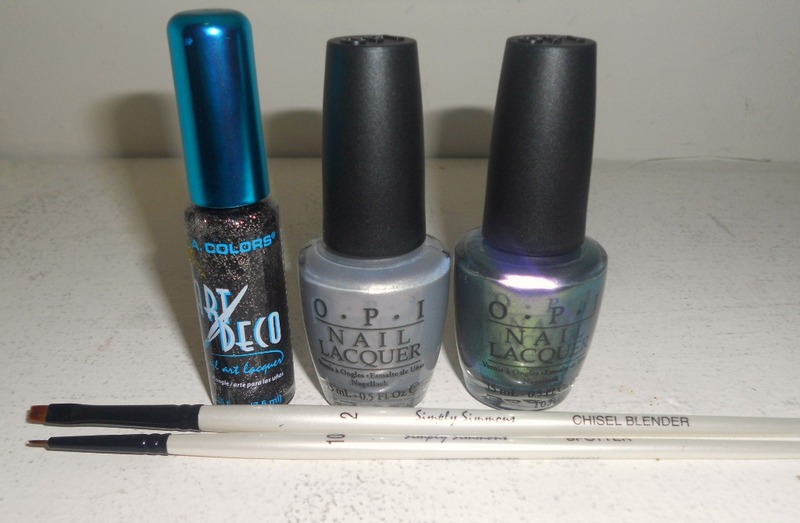 Revlon and then would be Nicole by OPI. I'm a sucker for Nicole by OPI's collections! Definitely reds and pinks. Dark, light, in between. Of course! I have so many that I don't own. I don't own any mattes and I have only one duo-chrome. I also don't have any holographic finishes. Whats the one polish you always pick up to lift your spirits? Anything with glitter. Whether it's chunky or subtle. I need some glitter when my life starts to get dull. What is the nail polish you wear most frequently? Rimmel's Green With Envy. I got it three years ago and I've worn it at least ten times since. I just love how bright it is! I have three heart-shaped nail polishes I got back when I was around 8 years old. I got them as a gift from my uncle--who I have lost touch with--and never had the guts to throw them out. I never wear them, but I just can't do it. Freehand. I love doing nail designs and nail art on my own. It makes me feel so accomplished. 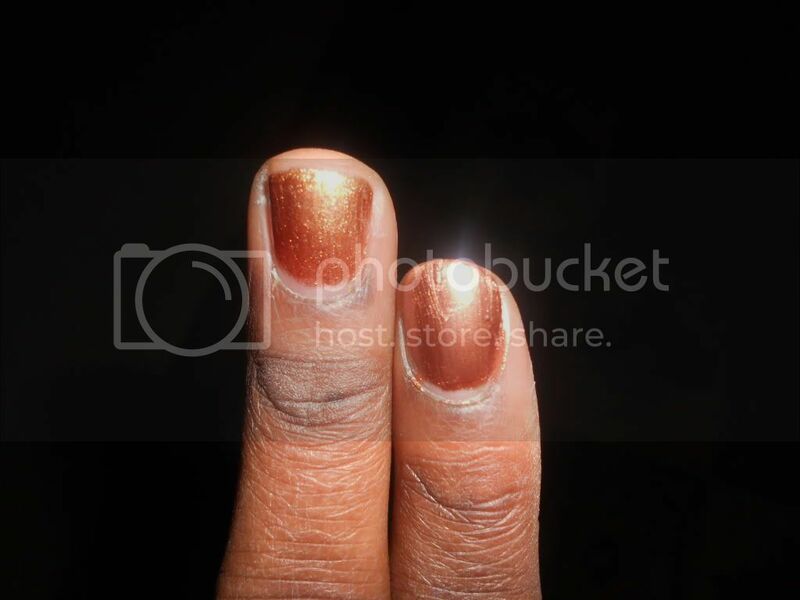 Do you consider your nails naked if they don't have nail polish on? Yes. I feel so naked with no nail polish on. I'm so weird about this. I feel embarrassed if my nails are polish-less. It's just a strange feeling that I can't explain. I don't have any special plates or tools. But I do love the gradient nail technique. I successfully did this not too long ago. Ombre nails are just gorgeous! What is number one on your nail polish wish list? 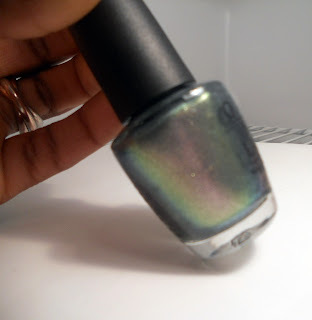 Orly's Space Cadet. I have been wanting this for months and will cry if I never get my hands on it. I was inspired by the many nail polish blogs on the Internet, Musings From Manhattan, Bright Lights, Big Color, For Your Nails Only, just to name a few. I've always loved nail polish, but it wasn't an obsession until a couple months ago. I've been collecting bottles of polish, writing out wish lists, and trying new things with my nails and I just now decided that I'd start a blog. It took me about an hour to come up with this name--which I'll probably change later--but I finally decided on Haute Lacquer. I'm still debating on whether or not I want to change it to Haute Lacquers or just something entirely different. I'm pretty happy with the name now so it won't change for a while. Anyway, I hope you decide to follow me as my collection grows bigger and my love for nail polish grows more and more. 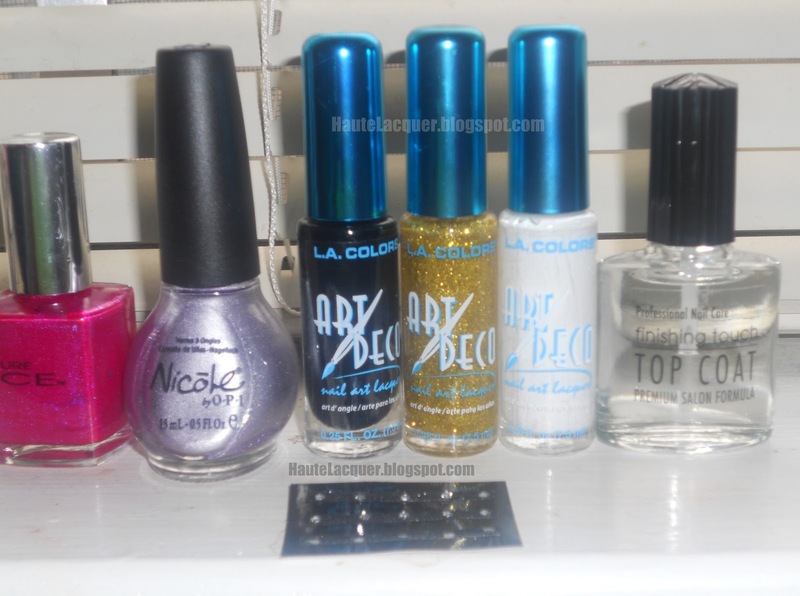 In the meantime, I'm gathering nail polishes for a future giveaway. I'd like to know how often and how big you'd like my giveaways to be. So please take a moment and answer the poll on the left sidebar.